CHART WEEK rolls on today. As a reminder, we’ve aggregated our weekly Film Study charts for the full 2016 season, and each day this week, we will use a few of those charts to learn something about what happened in 2016 and what might happen in 2017. On Monday, we looked at IU’s pass rush in 2016, and yesterday, Billy dug into IU’s passing offense. Today’s post delves into IU’s pass coverage, which, like the defense as a whole, improved dramatically in 2016. For the Coverage Stats chart below, I did not start tracking these stats until the Wake Forest game so these numbers are only for the “Power 5” portion of the schedule (the last 11 games). …But not too much because A’Shon Riggins is also pretty good. The true freshman held his opponents to under 8 yard per target and only gave up 3 TDs. Take out one rough outing against Penn State[ref] One of the best downfield passing offenses in the country, just by the way. [/ref] and those numbers drop to 6.3 YPT and 1 TD allowed – better than Fant on both counts. Obviously, if you remove Fant’s worst game, that would probably shift back the other way, but the point is that Riggins is more than capable of high-level coverage in his own right. Safeties Tony Fields and Jonathan Crawford didn’t end up in single coverage quite as much as the other three starting members of the secondary, but when they did, they acquitted themselves extremely well. Both allowed completion percentages right around 40%, yards-per-target around 5 and passes-defended rate around 30%. 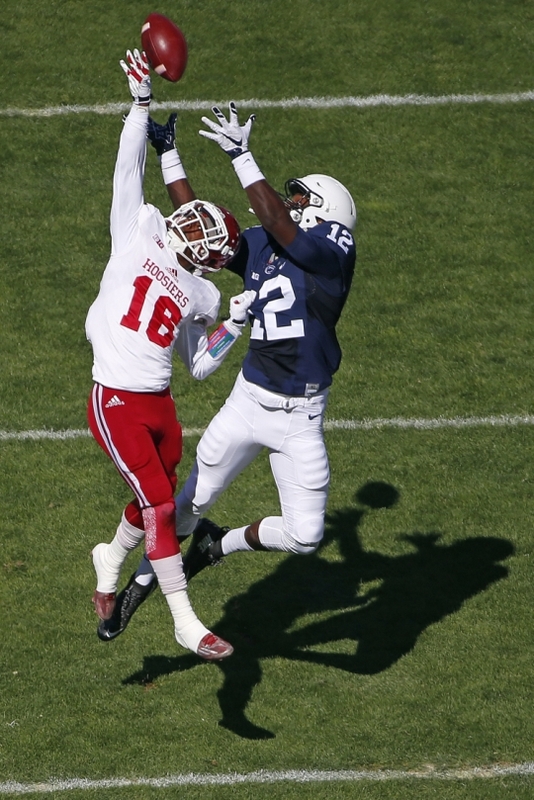 From a pass coverage perspective, IU might have the best safety duo in the B1G. And there’s depth at corner. In limited duty, Tyler Green allowed just one completion in 6 targets and broke up 2 passes. IU was stingy on intermediate throws[ref]Passes that travels between 11-20 yards downfield. [/ref] allowing just 6.1 YPT and 3 TDs. Tom Allen’s defense gave up quite a few short[ref]Passes that travels 10 or fewer yards downfield. [/ref] throws – more than 12 completions of under 10 yards a game – but they did a solid job of tackling and limiting big gains, allowing just 6.0 YPT and 3 TD, while picking off 4. Check back tomorrow for analysis of IU’s rushing offense…and more CHARTS.